If you have ever watched televised golf I’m sure you have heard an announcer bemoan the wildness of a golfer’s drive. Tiger Woods and Phil Mickelson in particular seem to dogged by comments about how often they end up in the rough compared to the field. However, I cannot recall hearing much talk at all about the distance golfers are hitting the ball. Now, a lot of that is due to it being easy to convey the advantage of hitting an approach shot from the fairway rather than the rough. We see the thick rough and remember the times golfers have been forced to pitch out into the fairway when they are behind obstructions. On the other hand, it’s difficult to convey the advantage hitting an approach shot from 20 yards provides to a golfer. However, that advantage is very real. The 2013 ShotLink data shows that, on average, PGA golfers hit the green on 71% of their shots from 125-150 yards, but on only 64% of their shots from 150-175 yards. In his seminal Assessing Golfer Performance on the PGA Tour, Mark Broadie shows that, on average, a golfer will take 2.89 shots to finish a hole from 137.5 yards, but 3.00 shots to finish from 162.5 yards. In other words, driving the ball 25 yards further provides a substantial advantage in hitting greens and scoring low. There is certainly an advantage to avoiding the rough also. According to ShotLink data, golfers hit the green nearly 76% of the time from the fairway, but only 51% of the time when they missed the fairway. Birdies are 50% more likely when you hit the fairway versus the rough (21% to 14% of holes). However, almost every golfer is forced to choose which skill – distance or accuracy – they want to attempt to excel at. Driving Distance and Driving Accuracy are strongly negatively correlated (R = -0.51), meaning that very few players perform well in both categories. For example, of the 216 golfers who exceeded 10 tournaments played or finished in the FedEx Cup top 200, Dustin Johnson ranked 1st in driving distance and 195th in driving accuracy. Rory McIlroy followed at 2nd in distance, but 181st in accuracy. Opposite those two, Russell Knox finished 1st in accuracy, but only 135th in distance, while Chez Reavie was 5th in accuracy, but only 159th in distance. As the following graph shows, only one of six PGA golfers exceed the mean for distance and accuracy (shown in red) and no one is +1 standard deviation from the mean in both distance and accuracy (shown in yellow). However, knowing that it is important to do both well, but difficult to do both well, is their one skill that predominates? 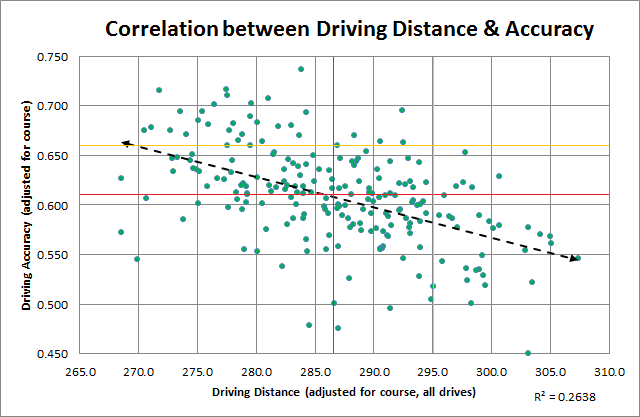 To determine just how important each factor was to analyzing driving skill, I set-up a regression of driving distance and driving accuracy on a golfer’s greens in regulation (GIR). Because the courses played can vary in difficulty, I used my course adjusted stats which determines how much better or worse than field average a golfer performed each week in each stat. These adjust most slightly, but for golfers like Tiger Woods who typically play tougher courses than average the adjustment can be significant. I’ve attached a Google Doc of every PGA player to finish in the FedEx Cup top 200 plus anyone else with >10 tournaments entered showing these adjusted stats. The results show that combining distance and accuracy predicts 50% of the variance in GIR (R^2=0.494). The p-values are highly significant and indistinguishable from zero, which certainly squares with the empirical stats provided in the second paragraph. To predict GIR, the equation is Y=(.00283*Distance in yards)+(.4418*Accuracy in %)-(.4429). Basically, hitting the ball an extra three yards is worth around 2% in driving accuracy, meaning a golfer should be indifferent to adding three yards of distance if it means giving up 2% in accuracy. If a golfer was provided with the choice of being one standard deviation better than average in one skill and one standard deviation below average in the other skill there is almost no difference between being good at driving distance and bad at accuracy or vice-versa (63.9% for good at distance and 63.6% for good at accuracy). This shows that performing well at either skill is a legitimate path to success on Tour. Using this equation, we can also calculate a Total Driving skill stat. The PGA Tour has such a stat, which they calculate solely by adding together a golfer’s rank in distance and accuracy. Mine simply ranks golfers based on their predicted GIR based on their driving distance and accuracy. The leader, Henrik Stenson, finished 8th in accuracy and 55th in distance, with a predicted GIR of 69.2%, meaning a golfer with average approach shot ability would’ve hit the green 69% of the time shooting from his average location. The worst golfer by this metric, Mike Weir, finished 213th in distance and 196th in accuracy, with a predicted GIR of 56.2%. Tiger Woods, who is regularly criticized for his wayward drives, actually finishes 20th in Total Driving on the strength of his 34th ranked accuracy and 78th (above average!) accuracy. His predicted GIR was 66.6%. On the other hand, Phil Mickelson is also criticized for being wild with the driver, and he has been wild this season (58% accuracy; 163rd on Tour), but his distance has killed him nearly as much. He’s only driven it 288 yards on average (98th on Tour). As a result, he was the 149th best driver on Tour last year. I’ve attached the predicted GIR/Total Driving stats in this Google Doc. I’d be curious to see the same results for 2012 and see what the relationship is to wins/earnings/Fed Ex Cup rank etc. yeah, I have the data for 2012. I’ll see if I can get around to posting it over the weekend. I think you would get an even better correlation if you used the distance from the edge of the fairway statistic to approximate Broadie’s degrees offline metric. I found it better correlated with scoring average than fairway percentage.